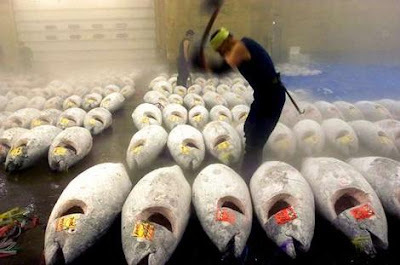 One of the striking allegations in End of the Line is that Mitsubishi is promoting the fishing of bluefin tuna to near extinction in order to profit from the large frozen stockpile of the animal that it has amassed. When bluefin have been wiped out, it is said, the price of those stocks will go through the roof. The corporation will then move on to allied species. P.S. 11 June: Jennifer Jacquet looks forward to raising the profile of a Stop Eating Seafood movement.